The "massive" public meetings would be held in Cauvery Delta districts of Tamil Nadu and top leaders, including Chief Minister K Palaniswami and Deputy Chief Minister O Panneerselvam will address them. Chennai: Ruling AIADMK today said it would hold state-wide public meetings on the Cauvery issue between April 25 and 29 to urge the Centre to implement the Supreme Court verdict to ensure water for irrigation in the Delta districts. The move to further mount pressure over the Centre by the ruling AIADMK comes following a "Cauvery Rights Retrieval Rally" held by arch rival DMK and its friendly parties between April 7 and 12 covering the same Cauvery delta region. Mr Panneerselvam and Mr Palaniswami, party coordinator and co-coordinator respectively, in a party release here appealed to AIADMK functionaries, workers and the general public to take part in the mega rallies. The AIADMK, which staged a state-wide fast on April 3, seeking constitution of the Cauvery Management Board (CMB) and to condemn the Centre on the issue said "the massive public meetings will be held to urge the Centre to implement the Supreme Court verdict." It said implementation of the verdict was imperative to release water for irrigation to delta districts from the Mettur reservoir on June 12. On April 3, ending the day long fast, Chief Minister Palaniswami had said, "We will fight, get justice and win." The hunger strike by '15 lakh' party cadres was reflective of the aspirations of the people and farmers on the issue, he had said. Facing a high pitch campaign and relentless attack from DMK and other opposition parties on the Cauvery issue for its alleged inaction, AIADMK said Mr Palaniswami will address a grand public rally on April 28 at Tiruvarur in the heart of the Cauvery delta region. On the same day, Lok Sabha Deputy Speaker and party's propaganda secretary M Thambidurai will address a rally at Karur. Deputy Chief Minister and party coordinator O Panneerselvam will address a similar meeting on April 25 at Nagapattinam district. State Ministers, including Food Minister R Kamaraj, Local Administration Minister S P Velumani, Fisheries Minister D Jayakumar will take part in the rallies, the AIADMK said. 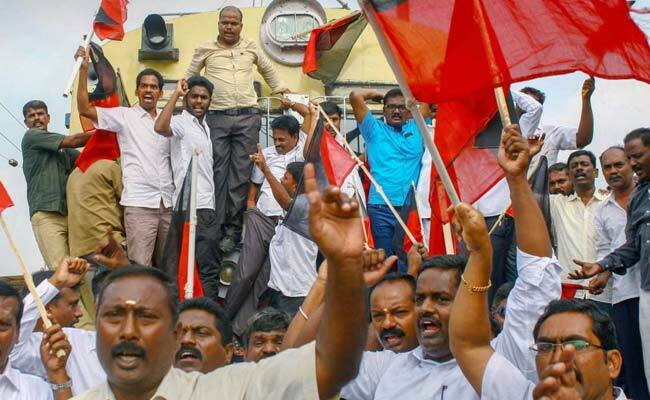 The AIADMK rallies also come against the backdrop of the DMK-led opposition parties' proposed human chain demonstrations in all 32 districts of Tamil Nadu on April 23 to urge the Centre to immediately set up the CMB.